An online poker bill has been reviewed by the New York State Senate in recent time but to no avail. The Senate is looking into the bill once again though with the potential for online gaming to become legal within the state in the near future. This is especially critical for timing as the current session for the state government is going to end in the near future. The state has tried often in the past to get such a move as this to allow online poker to be legal in the state. Although the state Senate successfully approved of the bill, it did not go through the Assembly as it had been suspended. No further discussions have been held since then but there is still a chance for some new hearings to come about in the future. The attempt to make games legal has changed in recent time in the hopes of trying to get it passed. One such change involves how authorities have more of a right to offer operating licenses to all companies that meet the requirements that the local legislation has to list. The new legislation being promoted is S3898 and it did pass a Senate committee in February so it can be considered by the Senate in general. Members of the Assembly that had frowned upon the original legislation have been interested in this one and have stated that it does make for a good step forward in terms of what may be done in the future. It is loosely related to similar moves that were brought up in two separate sessions. This one is aiming to be different and to possibly get the government to agree to allow more gaming opportunities to be available to people within New York. The New York Senate Racing, Wagering and Gaming Committee was responsible for getting the bill to move forward and to become more visible and potentially open. Even with this, a special session would have to be held in the hopes of trying to get the bill passed. This could get online poker to be legal if it is properly passed but the chances for that to happen are hard to predict at this juncture. A key aspect of the work to get the bill to be recognized comes from how online poker is being promoted as a game of skill and not of luck. If the government recognizes this point about the games then such activities would be legal all around the entire state. Texas Hold’em and Omaha Hold’em are especially being promoted as games that could be legal for how they don’t entail being lucky but rather using strategies to win. 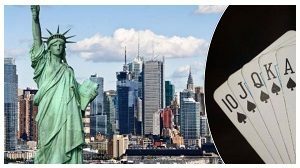 The general effort for making online gaming legal will have to go through the New York State Senate but it will be interesting to see. Changes have been made but there is a good need to look at what can happen and how people will respond to the moves that were made to make such games a little more visible and easier to play.